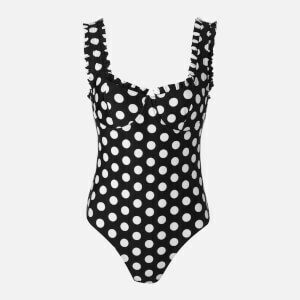 adidas by Stella McCartney swimsuit in a snakeskin-effect print. Crafted from flat, chlorine resistant fabric with superior shape retention and four-way stretch for maximum movement. Detailed with a round neckline, X-shaped rear straps and sheer mesh panelling. Logo branding completes the one-piece. UPF 50+. Shell: 100% Polyamide. Lining: 91% Polyester, 9% Elastane.